I focus my heart-love in the service of others. As I serve others through my deepest heart-love, my own love expands and becomes amplified. Such joy and gratitude fill me, when I open to my heart’s love! I guess “crazy-eyes” is what happens when I trace a bunch of infinity signs and add spirals around them. I wasn’t trying to do another crazy eyes; I just like infinity signs and spirals. The purple in the middle is infinity signs, symbolizing my heart-love focused in the service of others, infinitely. The blue infinity signs represent my own love expanding and becoming amplified. My love expands out from the action of being in service to others. The greenish, gold, and pink represents the energy that is generated from the expansion of my love. 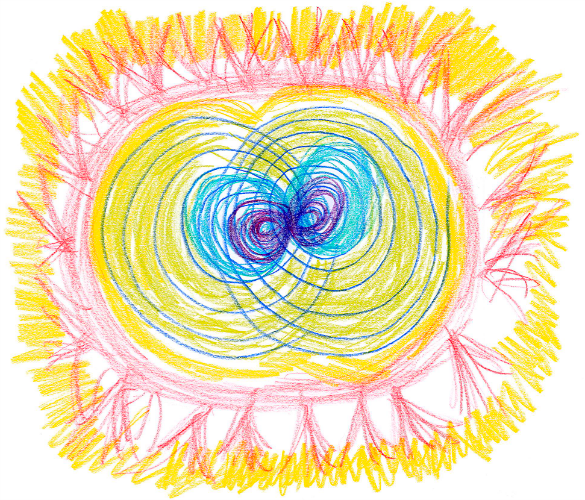 Then, when it expands far enough, it explodes in flares, spewing love out to everything! What’s interesting, of course is that if the middle represents infinite love and service, infinitely, and the explosion represents the love going out infinitely, then love is coming out from infinity and going back to infinity. I should say that I love concepts that can make my head feel like it might explode if I think about them too long (like infinity). I think God probably does not think in words…they are too limiting. The image I had in my head was not static, however, it moved; it was dynamic, there was swirling and shifting and waves and billows. It only lasted a couple of seconds, but it was a great thought-experiment; it felt expansive, like I really was somehow “getting” an answer to my question. I ask the questions so I can figure it out. I believe Jesus; I really think he was telling the truth about what we are capable of. If we’re not doing it, there’s just something we’re not getting. But we can.